The first show of my craft fair season is done and dusted. I have a few days 'off' to try and tame this cold - because man, I feel miserable! Thank goodness Doug doesn't mind selling. I pretty much sat in the background and let him deal with it. The photo is of a traditional design called Snails' Trails and Cat's Paws. All of these are gone now, but I'm revisiting the design in some soft muted blue/greens. I intend to get them done as soon as I get home from Vancouver, mid-November. If I can get them down quickly enough they will go into my 'shop' on the Circle Craft website. My shop is 'closed' for business right now, but as soon as I can get unpacked from the Circcle Craft Christmas Market, it will be open. There will mostly be tea towels, mainly because that is what I have the most of, in terms of inventory. I may list rayon chenille scarves, too. Mostly it will depend if I can get photos that are remotely close to the colours in the scarves. Tomorrow I am going to stay home. I may (or may not) wind place mat warps. I doubt I will feel up to weaving on the AVL, although I had hoped to finish the blue weft tea towels, maybe even start on the green cottolin weft. But all of that will have to wait and see how tired and miserable this cold is making me. Here I am at the loom having just caught the shuttle. Notice I have 'caught' it between my index and middle finger and am using my thumb to brake the bobbin and apply a slight amount of tension to the weft to ensure that it seats well around the outside end, creating a secure and consistent selvedge. Before the industrial revolution there were so many people involved in the production of textiles everyone pretty much knew what went into getting the fibre from the crop onto one's back. But now the vast majority of textiles are produced in factories, far away from the eye of those people who rely on textiles. In other words - pretty much all of us, one way or another. As hand weavers we keep the craft of textiles alive. As such I hold no secrets. I am quite happy to share what I know. If I get paid for it (such as by teaching workshops or publishing my hints/tips), even better. Because I am in this as a profession, not as a hobby. Weaving has never been a hobby for me. Spinning, knitting, bobbin lace - all hobbies. But not weaving. I tell people that while I don't take myself very seriously, I take my craft very seriously indeed. And over the years I've learned - quite a lot, actually. I have taken workshops from as many people as I could, bought numerous books, reading many of them cover to cover. And I've tried things. Many things. Failed too many times to count. If you consider learning a failure. Because sometimes the most valuable lesson of all is that you won't do that again! As I was weaving this morning - after too many weeks away from the loom - I hit my stride - my zone. And I thought about how, even when only surface attention is required, I am constantly monitoring what is happening. 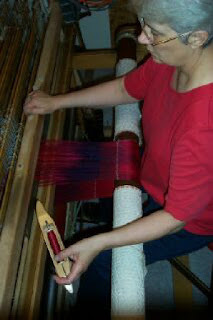 Paying subliminal attention to the loom, to the shuttle, to the weft. That even though it may look as though I am mindless, I am anything but. Rather, I am actually pretty engaged in what is going on. And when something happens that isn't consistent - the weft 'catches' in the shuttle, for example, I can immediately adjust and 'fix' that. 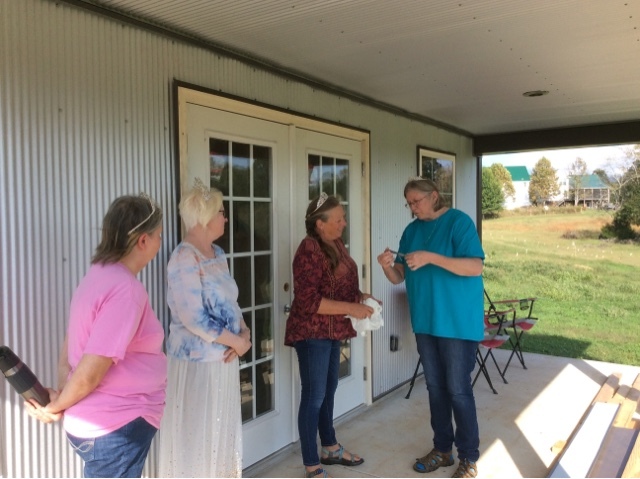 I rarely teach beginning weaving classes any more. I'd much rather students get their introduction to weaving elsewhere and then come to me once they have learned some of the vocabulary, some of the concepts, some of the principles. And then I can refine what they are doing. Tweak their skills. Advise on their equipment choices, their ergonomics. At this point in my career, I find this enormously satisfying. 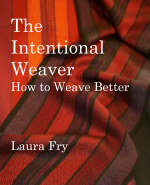 To see new-ish weavers take wing and soar. And all the while I think about all the giants who allowed me to stand on their shoulders. And I give my thanks to them for helping make me the weaver I am today. Yesterday Doug loaded the van with most of the stuff for the coming craft fairs. There are still a few things left to go in, including the cart we use to transfer all the boxes from van to booth location. This weekend will be the Artisans of the North at the University. We once again have a spot in the Doug Little room which is just off the Winter Garden (and Tim Horton's - but I digress). I'm low on shawls, although I think this one is still available. It's been a while since I sorted through the stacks and stacks of textiles. But I know I have very few shawls left. Never did make it to putting a shawl warp on. Because it isn't just the weaving of them. There there's the fringe twisting. Then the wet finishing. Then trimming the fuzzy bits off the ends of the fringe to make them look tidy. Then tagging. And I just didn't have the time or energy it would take to even think about getting more finished in time. So, I didn't even try. 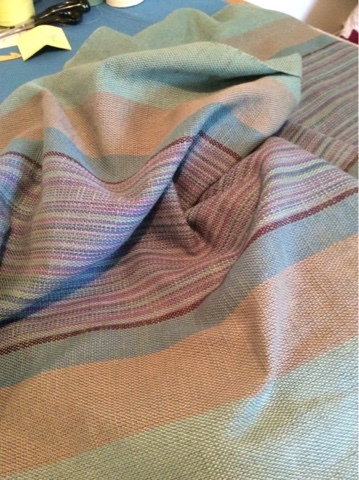 Instead I put another tea towel warp onto the AVL while getting a couple more white place mat warps woven. Yesterday I finished hemming the mats and now I'm working on the table runners I got woven over the summer. 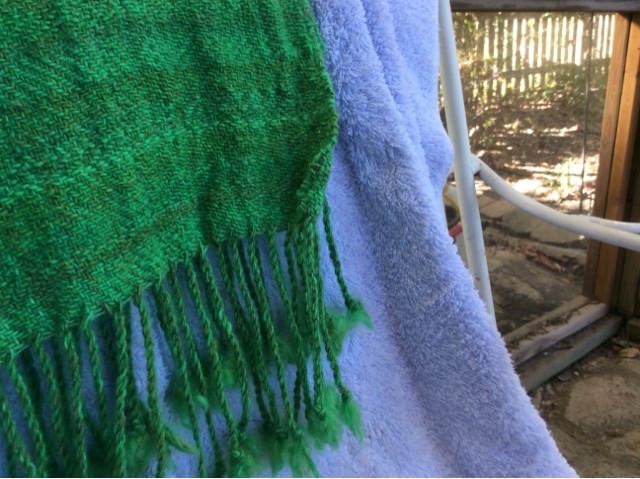 So even though I'm disappointed I couldn't manage more shawls I am satisfied I did the best I could given how this year started - with mom dying and all that that entailed to get her life wrapped up, then teaching, then all the dental work I needed. But the dental work is now finished (until next time) and once my mouth settles down I should be able to chew on both sides of my mouth. Which should help my TMJ - chewing only on one side of my mouth was causing issues with stressing my jaw. As Bette Davis supposedly said - getting old is not for sissies! If I have the time and energy once we return from Vancouver I will update my on line shop via the Circle Craft website and have a 'sale' before Christmas. Stay tuned. While I love being there, the getting there and back, not so much. The workshop, purportedly on Lace weaves, went rogue very quickly. I deny any responsibility for that. They just kept asking really good questions. When someone in a class asks a good question and the rest of the class also wants to know the answer? I will go down that rabbit hole. So we wound up talking about Fibre characteristics, ergonomics, tension, beat, shuttle handling. Best of all? They laughed at my jokes. Well, the travelling. That is not so loveable. But it's a lot easier to move me to them than to have all them come to me. Yesterday I had the pleasure of addressing a group of weavers, talking about lace weaves. As part of that I talked anout my 'messy' train of thought as I build a cloth, and that I am primarily a form follows function weaver. After the presentation one weaver came up to say that she worked for a group of engineers and that they were always saying "form/function, form/function". She said she now understood how that applied to weaving. This trip has been a lovely Interlude before the craft fair season begins with a bang in, oh, 10 days? Really it begins pretty much the minute I step foot back in my house next Monday evening. Then it is four weeks of scramble, plus a slew of appointments stuck in between trying to pack, set up, make nice, hope to sell enough to pay off my debt and have some left over to get me through the winter. The downside of easing back on the teaching is...less income. So, once the sales are over I will need to stare that manuscript down and get it finished. I'm still a minimum of six months away from completion of the manuscript, plus all the rest of what needs to happen to it after that. Bottom line? A bunch more money going out before it will (hopefully) bring some money in. Sometimes I do things just because I want to know what happens if I do this? Or if I change this, how will it affect that? Over the past while I have been working with a spinner and looking at things like twist energy. Today we wet finished the three scarves I wove with handspun singles. 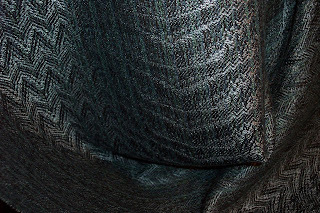 And the corners of this scarf curled. We have had a good chin wag about how the yarns were the same and how they are different. We have come to a conclusion. We are pretty confident in why it happened but more experimentation will be required to prove or disprove our evaluation. In the meantime, it was an interesting exercise. Proving once again that you never stop learning if you just keep asking "what if?" There is nothing like finding kindred spirits, even though hundreds (thousands) of miles may separate us. Every once in a while we gather, to share hopes, dreams, highs, lows. Today we visited Ann Marie's new studio and put our stamp of approval on it. Tomorrow we separate further, although Mary and I have a few more days together. We will finalize a joint project and hopefully wrap up what we have done to this point. And then I begin my slow journey home with a stop in the Pacific Northwest to help ease me back into fall weather. 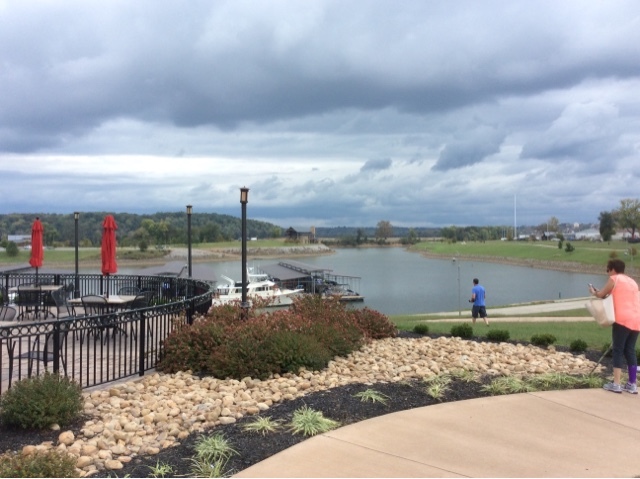 Because today home had first snowfall and I am spoiled for winter after spending time in Tennessee. But soon it will be time to enter back into the fray of the craft fair season before the descent into full winter. I'm at the fun bit of weaving - sitting at the loom, contentedly weaving away, piling up the yards/meters. Thinking. Because when everything is going well and you only need surface attention for the task at hand, the mind can go wandering. This morning I was thinking about how cyclic in nature being a professional weaver is. My year end is not Dec. 31 but oh, around now. The craft fair season begins very shortly and if I haven't got it ready for sale by now? It probably isn't going to be ready for this year. So what I am actually doing is working on inventory for next year. I am also stash busting - to a certain extent. 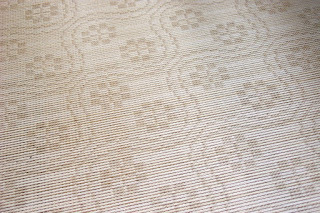 While the weft I'm currently using is 'new' - as in purchased in Sweden at Va:v last month, the warp yarns have been in my stash for considerably longer. This summer I did not have my usual 'birthday' sale so I am thinking of getting new items loaded to my Circle Craft shop as soon as I get home from the Circle Craft Christmas Market, mid-November. Maybe by then these towels will be finished. Or very soon after I get home. My 'shop' is currently closed due to my travel schedule, but I haven't forgotten about it. There are a whole bunch of things that have had to be put on the back burner, but I have not forgotten about them. Number one is, of course, The Book. I got the last set of edits in June but have just not had the time - or energy - to deal with them. Again, hopefully after the craft fair season. Doing the new edits can actually be - not relaxing, exactly - but a different kind of activity, one particularly suited to winter. Plus the perennial conversation about all things weaving, generally process related, goes around again. So finishing The Book seems particularly important, if only to give people more information than is generally available. If you don't know what you don't know, you don't know that you need to know it. My hope is to fill in some of those cracks in people's fundamental knowledge so that they can make appropriate choices. 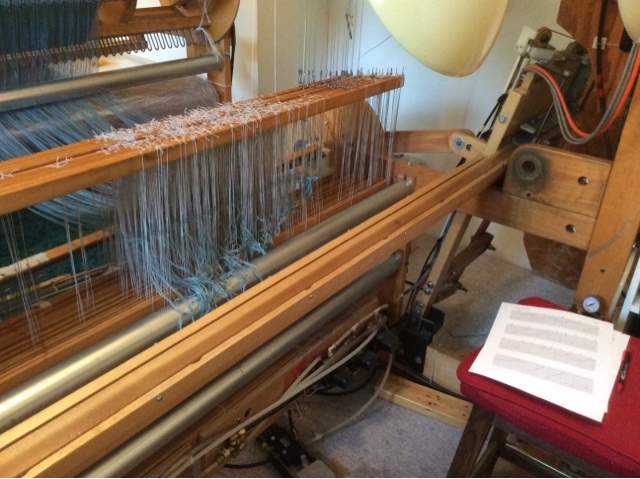 As for the web on the loom, yes there are reed marks. No they may not come out 'in the wash' (wet finishing) but they are consistent and therefore part of the character of the cloth. I'm good with it either way. And yes, that's a three thread float on the selvedge. And no, it doesn't bother me. It's fine. And no, I don't use a floating selvedge. 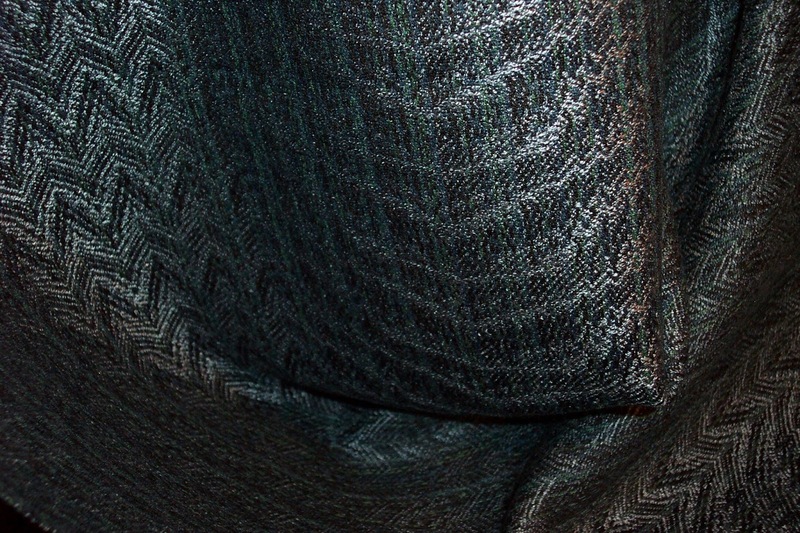 See my other blog posts on Selvedges. Whole lot more to good selvedges than using a floating selvedge. Or an end feed shuttle. Etc. I have visited the province of Dalarna, Sweden several times and as such have also visited a number of glassworks and gotten to know a little bit about glass as a material. One of the phrases heard about glass is that it 'has it's own time'. In other words, the glass worker must tease it into the final shape by understanding how the molten glass behaves and when it is appropriate to shape it. So too, I think, does linen have it's own 'time'. Or at the very least, it's own humidity in order for it to behave nicely. I bought some singles 16 at Va:v and this morning I started winding bobbins to place in a humidor. I live in a much dryer climate than linen really appreciates, so it is important to allow the fibre to take up moisture so that it co-operates in the shuttle. 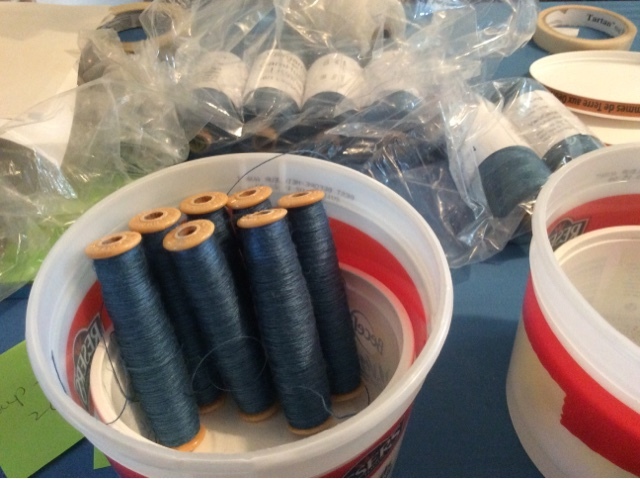 Yesterday I got the 2/16 cotton warp threaded and later today I'll sley and tie up and hopefully begin weaving. I ought to have started winding bobbins yesterday so that they would have a good 24 hours to take up moisture, but I was distracted with other things and didn't remember the linen really needs a little coddling in terms of humidity. Hopefully it will behave for me when I get started weaving. I only filled one humidor this morning but that should be plenty to start weaving. I'll wind more later today and fill the other two humidors I made with a couple of plastic tubs and a lid. When everything is going well, I can go through quite a few bobbins in a day so I want to make sure I have them ready - and willing - to go. Life is full of bumps, lumps, twists and turns. The last couple of warps that I put onto the AVL I had some errors that required fixing and this time I decided I needed something that would be simpler to set up. It's also something that many people find attractive - a twill block version of the traditional Snail's Trails and Cat's Paws design. 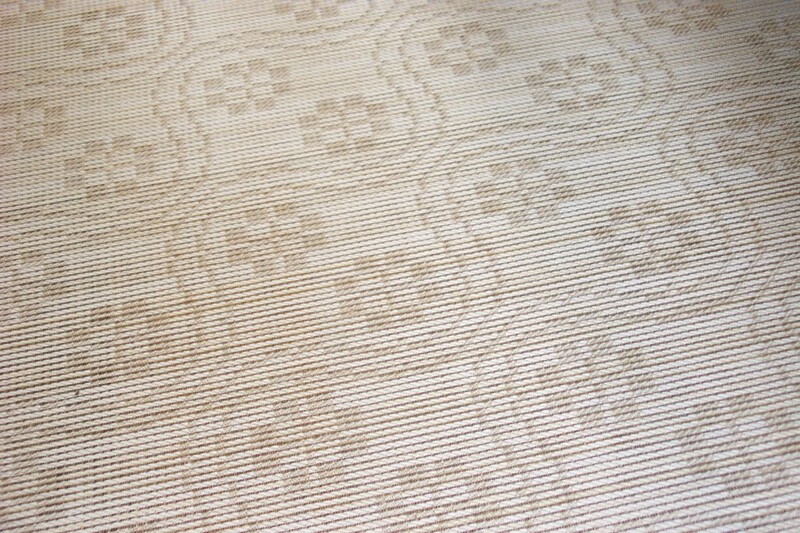 I have some of this design on hand but they are 'neutral' colours. The linen I brought home from Sweden is a lovely rich somewhat 'off' blue, not dark dark, but deeper than what I would consider a medium value. 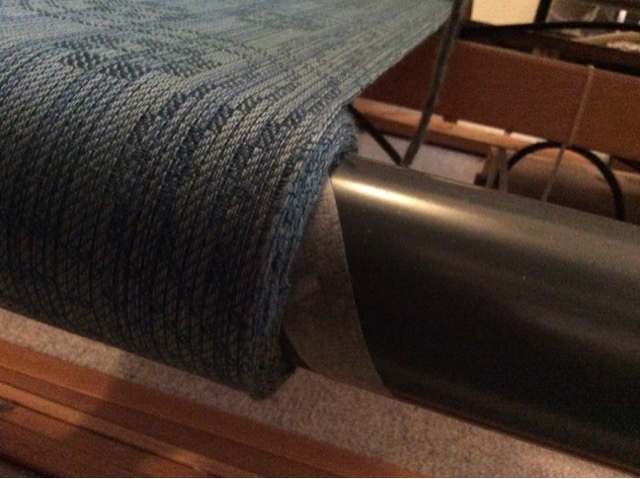 As such I thought it would go nicely on this warp made up of greyed blues and greens in a medium value with a few darker blues, almost identical to the linen, to make up 32 spools for sectional beaming. I have just now finished threading and rather than continue I need to do some administrivia - both sales taxes are due. I don't owe anything on either of them but the paperwork has to be filed and I'd rather do it now before I leave on my next trip. Because when I get home I will have to hit the ground running, as they say. My schedule is gearing up towards the craft fair season and I have three back to back, each one longer than the next (2 days, then 3 days, then 5 days) with a 450 mile trip each way for the last. Circle Craft is the last show of the season and is pretty exhausting, coming at the end of my shows. Well, the guild does a small show but that is in December and only two days, in the guild room. Usually a time when I can spin or knit or putter. I am also hoping I can update my shop at the Circle Craft website for a 'sale' - just in time for Christmas? With this warp I wound up with no 'extra' threads which gives me hope that I actually managed to follow my threading draft and not make any mistakes. We'll see!